Radio direction finding and fox hunting can be great fun and is a popular activity with amateur radio (ham radio) enthusiasts. These antennas are great and are not only good for finding transmitters but also will greatly increase directional distance performance including communicating with satellites and the international space station (ISS). [jcoman] had a nephew who was interested in learning about amateur radio so [jcoman] figured building and using a cheap and portable 2 meter band VHF Yagi style beam antenna would be the perfect activity to captivate the young lad’s interest in the hobby. His design is based on [Joe Leggio’s] (WB2HOL) design with some of his own calculated alterations. We have seen DIY Yagi antenna designs before but what makes this construction so interesting is that the elements come together using bits of cut metal tape measure sections. These tape measure sections allow the Yagi antenna, which is normally a large and cumbersome device, to be easily stowed in a vehicle or backpack. When the antenna is needed, the tape measure sections naturally unfold and function extremely well with a 7 dB directional gain and can be adjusted to get a 1:1 SWR at any desired 2 m frequency. The other unique feature is that the antenna can be constructed for under $20 if you actually purchase the materials. The cost would be even less if you salvage an old tape measure. You might even have the PVC pipes, hose clamps and wire lying around making the construction nearly free. We were quite surprised to find that such a popular antenna construction method using tape measure elements had not yet been featured on Hackaday. For completeness this is not the only DIY tape measure Yagi on Instructables so also check out [FN64’s] 2 m band “Radio Direction Finding Antenna for VHF” and [manuka’s] 70 cm band “433 MHz tape measure UHF antenna” postings. 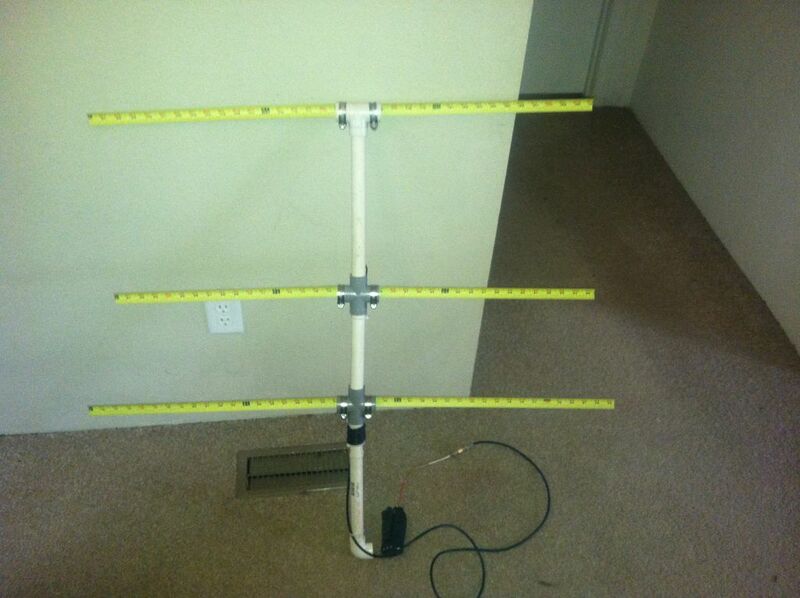 The other Yagi antenna designs featured on Hackaday were “Building a Yagi Uda Antenna” and “Turning an Easter Egg Hunt into a Fox Hunt” but these designs were not so simple to construct nor as cleverly portable. I’ve used military radios decades ago whose antennas were technically identical to a tape measure segment, they were unusable during strong winds but simple and effective nonetheless. If high winds are an issue, couldn’t you just shroud the elements in short lengths of PVC pipe for only slightly more money? putting the elements in pvc piping will change the velocity factor and require retuning (shortening) of the antenna elements.my personal experience was that the effect of the PVC changed the antenna’s SWR from 1.4 to near 10. PVC is not that great for HF applications (higher absorption than PE or PP). And you lose the advantage of the flexible tape measure segments for a small package. In that case you could simply use Al tubing. I’m surprised to see that this IS being featured on hackaday. It’s one of the best-known homebrew antenna techniques, and is not novel in concept nor execution. I understand that many hackaday readers have never heard of ham radio nor libraries and will thus be downright gobsmacked at a QST article from 1974, but that still doesn’t make it a hack. That being said, there’s plenty of rich soil to till here. For example, tuning and adjusting a Yagi’s feedpoint is a PITA, and there’s surely some modern SDR trickery that could improve matters beyond the age-old cut-and-try method. Innovation in this era (aka bringing ham test gear out of the dark ages) would be both interesting and useful day-to-day. Also, while it’s true that there’s a century of not-really-hacks built up in the ham tradition, much of the tube-era stuff doesn’t apply, and a lot of the relatively recent microcontroller stuff was written by really clever folks with their heads firmly in the sand with regard to open-source. Revamping 90s-era PIC-based projects which require proprietary compilers or byzantine cycle-squeezing ASM code, on a modern micro with an OSS compiler and modular high-level code? Yes, please. It seems it is a common misconception about this site: it isn’t “genuinely novel things nobody have thought of before”-aday. I have made some antennas, have searched for information on making Yagi antennas and in that process haven’t seen anything like this. It is clearly a hack re-purposing easily available materials so why complain? I am glad somebody posted this here, because it is a nice and very cheap antenna. On the other hand the tape measure antenna is really mentioned in my copy of the ARRL Antenna Book (2012) and the original article is provided on the CD accompanying the book as well. I don’t care if it’s a hack or not, I like it. But I do agree with Nate B. Tuning and adjusting a Yagi can be finicky. I’ve built a couple of Yagis from old antennas that should work well by the numbers. But even when brought to my desired frequency the SWR is higher than I’d have desired. They work okay, but I feel like I should be able to do better. An accessible tutorial on the design of these antennas would be wonderful, particularly using software that could run on my Linux system…. Just to reply to my own comment. I’ve had enough unsuccessful antennas (and successful ones too I suppose) to regard any good antenna as a hack. The frustration of spending days or weeks building and tuning an antenna only to find that it’s nearly unusable (or bested by a cheap G5RV) is immense. Beginners luck I guess because it’s never, ever happened again! Now I’m trying to tune a fan dipole with inductor-loaded 80,40, and 20 meter and full size 10 meter elements to fit in my attic…what a nightmare! Look up 4nec2… it’s a free NEC(2) antenna modeling program. There are tutorials for it and it’s pretty easy once you have the basics. It does Yagi’s(stacked ones, too), dipoles, verticals, helical, parabolics… pretty much anything you can think of. And there are plugins available for specialty calculations. Kind of like EZnec, but free(aside from the castrated ARRL demo version). Ham’s have been building these for 50 years now. Glad to see they are being covered for the newbies out there. This design is quick and dirty, so if it works well it is definitely a hack. Some years ago I spend a long time building a circular-loop Yagi-Uda array out of copper tubing. It turns out there are some painting buckets for sale at Home Depot that have the perfect circumference for several bands in the UHF spectrum. I mounted the elements on spokes radiating from a plastic nuts screwed onto a piece of Nylon threaded rod (all mcmaster.com). This was handy for small tuning changes. It performs extremely well, but it wasn’t easy to build, and without a VNA it would have been impossible to tune. I have seen some military ones that also use multiple spring steel shaped like a take measure that are all loosly rivited together to give it more strength and then covered with a thin layer of loose rubber. I believe cubsats use spring steel (tape measure tape) for antennas. But how to make sure that the antenna lengths are the correct length? Actually, i was thinking this would be great for simple classroom project for EE students. because of the wavelength being already enumerated on the element. This would make a nice FM radio attic beam, at 31 to 37 inches it won’t droop much. It’s easy to get up the hole, strong enough and won’t rust inside. This stuff will rust and spoil the skin effect that is vital at VHF and up, so no outdoors use long term without coating and that will mess with velocity. My home TV antena is a Yagi style, nd it has problems. Some nature-lovin’ neighbor has taken to feeding the local birds, and the fat sods have taken to sitting on my antenna, waiting for their next free feed. The reflector beam, being the longest, has snapped under their weight and the remaining sections are bending. This may seem simple, but tie a sting somewhere and place a few long pieces of hi-vis plastic tape or ribbon on it(like a streamer). The movement frightens the birds. They will get used to it after a while, so you might have to change things up every once in a while. Actually, it has been reported to me that the 2m design works very well at 70cm without any changes at all. Old Ham here. Some of my fondest memories was building various antennas. I buildta lot of PVC 1/4 waves across different bands. Yagi’s, Gizmotchies, J-Poles, Helical, Romboids, Wire, Cubical. Even some that were wood planks with wire attached to them. A lot of fun! Of note, I strung usually cheap, coated copper wire, from Radio Shack on the outside of the PVC. Putting it inside the pipe made antenna efficiency lower. Fiber glass is opaque to most radio waves, so is wood.